Here are the decorations I’ve collected to decorate the tiny gingerbread houses that decorate mugs which I’ll be making this year. The houses are so small that decorations to be sprinkled on are all you need. I tend to keep an eye out for holiday worthy sprinkles and decorations all year long, so some of these might have had me contemplating the holidays in the middle of July. 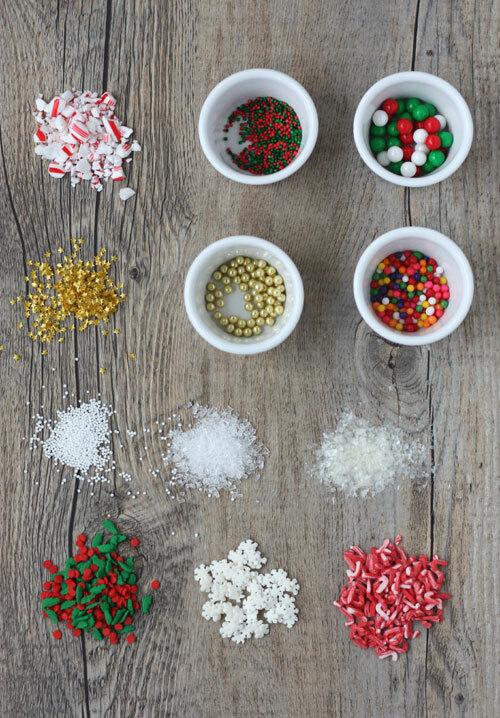 Nonpareils – Tiny and crunchy and if you get one of those containers with sections for six different colors you can create your own color mix. Sugar pearls – These are like giant nonpareils, I found these at a discount store. Itty bitty edible gold foil stars – Itty bitty edible gold stars! These are amazingly cute. I’ve found these sold by Wilton in the baking aisles of Michael’s and Joann stores as well as specialty cooking shops. Gold dragée – I want more gold in my holidays so I was thrilled when I found these. Unlike their silver counterparts these are safe to eat since they’re made using edible metallic dust. Oversized sprinkles – Colorful like twinkle lights. These are from Wilton and they make me very happy. White nonpareils – I like the details of a sweet covering of precious little snowy white balls. Sanding sugar – The larger sugar crystals sparkle nicely. Edible glitter – I bought this at a specialty cake supply store where the owner assured me that the edible glitter is the best for reflecting the sparkle from twinkle lights. I’ve done a terrible job at conveying that in this photo. The last row are all from a decoration set that came in one container. Holly leaves and berries – Sweetly festive. Tiny snowflakes – You can place these individually if you want, or just sprinkle them on and let randomness do it’s job. Tiny candy canes – Much to my dismay they don’t actually taste of peppermint, but all is forgiven because they are terribly cute. Don’t forget! 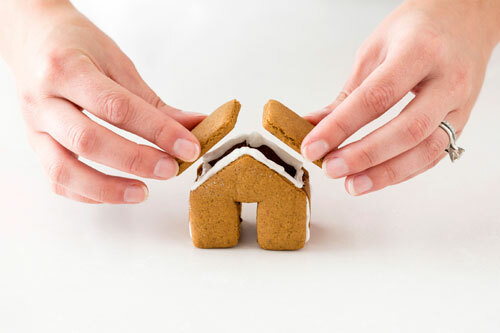 This winter I’ve collaborated with Brit+Co on a DIY kit which includes cookie cutters for my tiny gingerbread houses! It makes creating the gingerbread houses very easy. Go have a peek! You could probably make the tiny candy canes taste minty by rubbing a little peppermint extract inside their container–peppermint is a very contagious flavor! I ordered one because it was so damn cute. I look forwards to many hot chocolates with tiny houses perched on the edge – perhaps with icebergs of marshmallows bobbing in my hot chocolate. Jenne – Ooh, that is good advice, I’ll give it a try, thanks! Nazila – please flambe the marshmallows and watch the burning house drown! Kay – What a lovely image! Make lots of earthquakes in mug world and hopefully the roof will drop more peppermint shards! Wrapped in a cozy robe, shuffling downstairs in furry slippers and being greeted with a warm cup of cocoa with a cute tiny house on the rim. What’s more merry than that?! I love the perched gingerbread house! 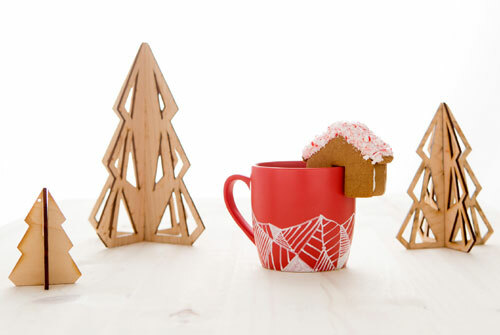 I was looking through a Williams Sonoma catalogue last night and noticed they were selling something very similar – they call it a gingerbread house mug topper. These are so adorable. I am tempted to make some Halloween versions come next October..
Roxanne – So I saw, thanks for letting me know about them. Carrie – ooh, put them over spiced cider! Will you be selling the little house cutter on it’s own in the future? Would love to get one!